Written by Band Boosters on August 17th, 2018 August 23rd, 2018 . 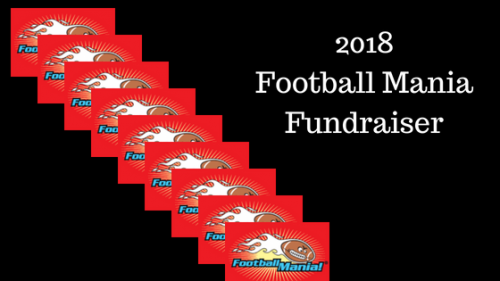 This year we will once again be doing a “FootballMania” sweepstakes fundraiser for the band. This is a fun and easy way to raise money, and we had great success with it last year. Important note: Selling tickets at the games, on the SMHS campus, or at any PVUSD property is prohibited. How it works: Band parents sell tickets for $20 each to friends, family members, acquaintances, etc. Each ticket includes a code to access the associated downloadable music. Each ticket also includes a complimentary sweepstakes game card. Game cards contain 3 random teams for each of the 17 weeks of the pro football season (you get 3 new teams assigned to your card each week). Participants simply add up the points scored by their 3 teams. Each week, the highest-scoring game card wins $400. The next 14 highest-scoring cards and three lowest-scoring cards win prizes ranging from $25 to $100. There are 4,960 unique game cards, so there is a 1 in 17 chance to win a prize during the season. You can sell paper tickets. Contact Tom Cadden or John Chichester to obtain the tickets (their emails will be posted in the Facebook Group). One or both will also be at football games, just let them know how many tickets you’ll need. When you sell a ticket, please keep the stub and return it along with the money to either Tom or John, or put it in the grey drop box in the band room. There is no charge for unsold tickets, but we ask that you return them to us. People can pay for paper tickets either with cash or with a check made out to SMHS Band Boosters. Direct people to buy online with a credit card on a secure website (http://www.charitymania.com/give/A8321). You can send this link out to your friends and relatives via email or Facebook. Tickets and money must be turned in to Tom or John by Friday, September 7th so tickets can be activated for the full 17-week season. Tickets can be sold or purchased after September 7th, but the buyer would only be able to play for the remaining weeks in the season from the time purchased. Remember, this is an easy way to help defray costs for the band. The band gets $14 profit for each $20 ticket sold. If 60 band families sold (or bought for themselves) just one ticket each, the band would clear $800. Think how much more we can make if everyone can sell just a few tickets!